Recently, a number of blogs have reminded me that there hasn’t been a pizza featured on frugalfeeding for quite some time. I don’t necessarily feel that an average, commonly found pizza has much of a place on food blogs, since everyone knows what they are and how to make them. This recipe, however, clearly isn’t average, since the base isn’t spread with tomato sauce. Instead, it is scattered with cheese that melts readily, such as cheddar or mozzarella. This is an idea which first came to my attention during a visit to a pizza café in Bristol, which served something similar to this, only with caramelised onions and less mushrooms and garlic. It was delicious and I’ve been fascinated with the idea ever since. As you might imagine, the replacement of the tomato sauce on the base by a thin layer of cheese makes the whole pizza-eating experience that little bit lighter. In addition to this, it also has the effect of bringing to the fore the flavours of the topping; an admirable trait, to say the least. There is, of course, nothing wrong with making a pizza using tomato sauce, but it is a shame to disguise the flavour of some of the more delicious and delicately flavoured ingredients out there. You may be sceptical, but give it a try – it simply won’t disappoint. Then again, such a claim is only true if one is a fan of cheese. I’d highly recommend making one’s own base for a pizza such as this; it would be such a shame to sully the overall effect with sub-par bread. Why not do what I did and follow a Jamie Oliver recipe, divide it into portions and freeze it for later use. In doing this, one can make enough pizza dough for 5-6 meals in around a couple of hours. Don’t be lazy, there’s no need for it. On a different note, isn’t it brilliant that Nadal has crashed out of Wimbledon? To be honest, I couldn’t quite believe my eyes, but in my opinion, he showed just how petulant he can be when things aren’t going his way. The silly Spaniard. Not that I have anything against Spaniards… or silly people. 1. 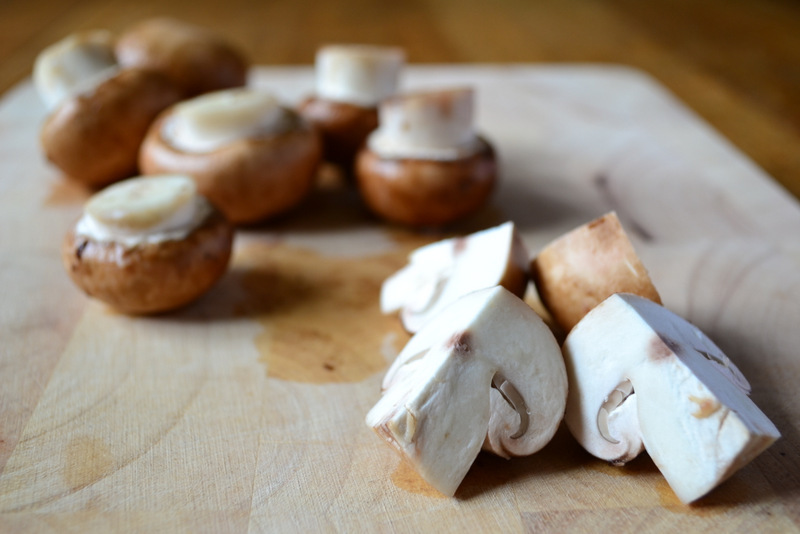 Begin by frying off the mushrooms and garlic in olive oil until the former have reduced in size and most of their water content has evaporated. Stretch out the pizza base and cover it with the cheese, leave a border of a few centimetres. Add the mushrooms and garlic to the top. Pop it in the oven at around 220C. 2. Once the top of the pizza is golden, the cheese has melted and the base is hard remove the pizza from the oven. Top it with a handful of rocket and enjoy! 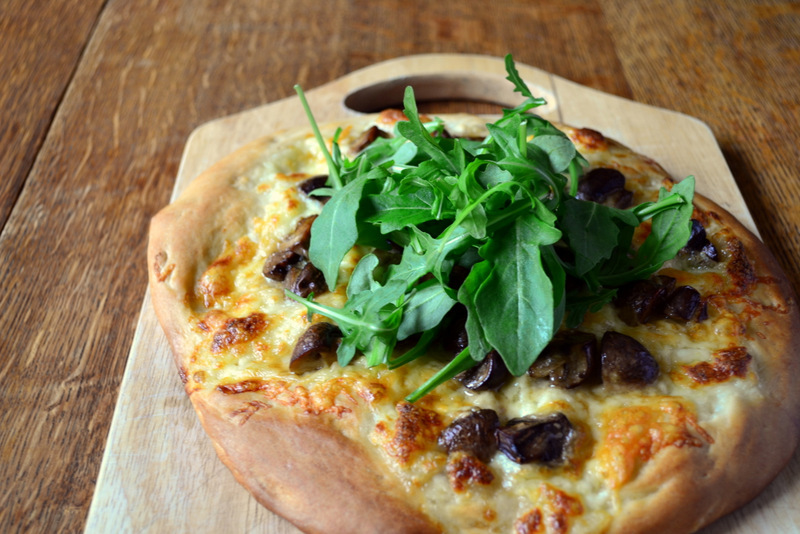 Cost: The pizza dough, if made at home, is extremely economical at around 15-20p. The topping is, understandably, a little more expensive, though this isn’t a particularly extravagant pizza. Indeed, the entire meal, which could serve up to four (with salad), should set one back no more than around £1.80. That’s a lot cheaper than any pre-made pizza that you’ll find anywhere. Thanks so much! I hope you get round to it soon. You’re right :D. I’m glad you think so! This looks fantastic! Another pizza sauce idea: puree roasted garlic cloves into a paste and spread on the pizza dough. I have a pizza post going up tomorrow that uses this and it is UNBELIEVABLY good. Thanks! That sounds incredible! I adore roasted garlic. I had a pizza once at a long-gone restaurant. They squeezed an entire head of roasted garlic onto the pizza dough, drizzles with olive oil, topped with spinach and feta cheese then baked until cheese oozed & browned, om!g it was so good, no leftovers, at least 3 inches on my wasted waist! That sounds amazing! This roasted garlic thing has been suggested to me. Perhaps I’ll do it! Haha! Pizza! Possibly the perfect food! Love your white version with mushrooms. It occurred to me as I read your last line about the cost that when you make pizza at home, you could top it with just about anything (with the possible exception of truffles and caviar) and it would still be far cheaper than anything you could buy. And massively better too! Possibly :D. Exactly – I hope I’ll prove that over the course of the next couple of weeks, Celia! Thanks, Amanda! Mushrooms really are the perfect ingredient for this. Haha, that sounds idyllic. What a wonderful pizza, I love white pizzas too. As you say people should make their own dough, it’s so easy and the taste is amazing. Thanks! They really, really should! That is certainly not an average pizza! It looks delicious. By the way, Hugh Fearnley-Whittingstall (whose recipes I am enamored by) has some great pizza recipes which are also a little different than ‘normal’ pizzas. And his multi-purpose “Magic Bread Dough” recipe is awesome…it makes wonderful pizza bases and tasty bread too. Haha, free your mind and make it, Aimee! I’m not a huge white pizza fan but this one looks super flavorful! I bet it’d be great with some sauce too. I haven’t made a homemade pizza in awhile! Thanks, Cecilia! What a good idea! I hope it turns out well. Who doesn’t like pizza and it’s just all the more desirable if it’s home made! The step by step recipe is so useful. Exactly. Everything is better made at home :D. Step by step is the only way to go. Looks delish, have bookmarked the pizza dough page and will make some for the freezer, what a great idea! Thanks for encouraging me to be more frugal, I need it with the high supermarket prices in Singapore… Cath. Thanks! I didn’t realise they were that expensive over there – not that I’d know… I’m glad to help. Thanks! That sounds lovely :D. It’s one of my favourite pizza ingredients. there is something about mushrooms on pizza that truly rocks my tastebuds. Love them lots. Now if only I could convince the rest of the family as well. I completely agree! I think it’s because you can taste them so clearly. My belly is grumbling for a slice of this pizza! I love its simplicity! Thanks! It was so yum. you are making me very hungry!!!! I love pizza bianca. I think it was all I ate when I was in Rome (well, that and gelato). I think you’re absolutely right in saying it brings out the flavour of the toppings, whatever they may be, forcing them into the spotlight a bit more. Oh my lord, the gelaterias in Italy are incredible. Exactly! It worked very well for these mushrooms. The fresh greens on top are a nice touch. Thanks! It’s always good to have a little colour contrast – it makes food more interesting. I tried freezing some pizza dough recently and ended up disappointed. The fresh batch of dough made delicious pizza, but the pizza made from the previously frozen dough was flat and soggy. Have any suggestions for freezing pizza dough? Maybe I need to try the Jamie Oliver recipe. Oh, and I was happy to see Nadal exit Wimbledon too! Par-bake it for 3 or 4 minutes before freezing, then cook from frozen. I do this all the time and it is so handy. Hope the tip helps and Frugal doesn’t mind me making a suggestion! That’s an interesting idea, I’ll have to try it! Or, I’ll have to try letting my dough warm more like Frugal suggested. Next time I make it I’ll have options! Yes, it really must be warm enough. What a good idea to replace the tomato sauce with cheese, something I have never even thought of, I’ll have to give this a go and soon! 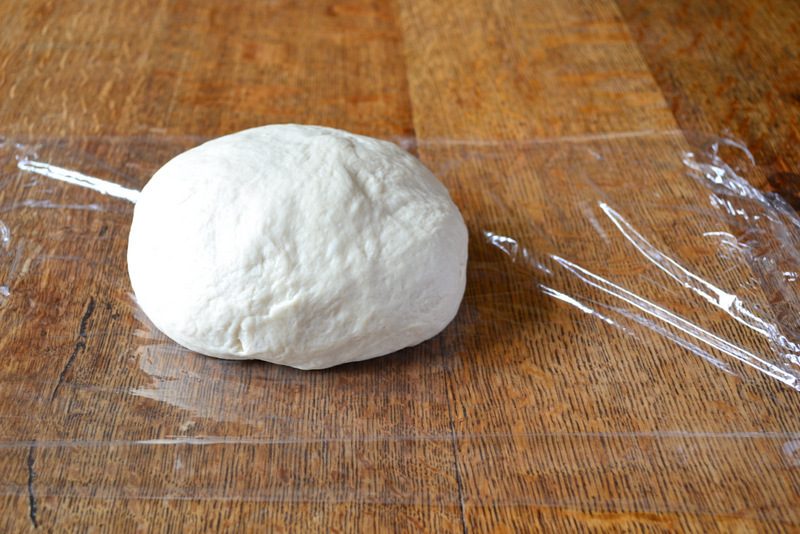 flowercityfoodie – Pizza dough actually freezes better if you roll it into shape before you freeze it rather than leaving it in a ball. Thanks! It’s so delicious. The only problem with that is that it’s more difficult to store and far more brittle. But I’ll try it next time. Loving this combo! I love pizza – especially coming up with new toppings. I recently tried using some ricotta in place of tomato sauce – very interesting! Thanks, Stephanie! It works so well. That sounds yummy. I think I´m ending up in your spam box as my recent comments don´t seem to be on your posts 🙁 Is it because I´m living in Spain 😉 Love Pizza Bianca…..or white pizza and these flavours are wonderful. No, for some reason they are needing to be approved. I’ll sort it out – I’ve been awful with comments this past week. Thanks! Love it. 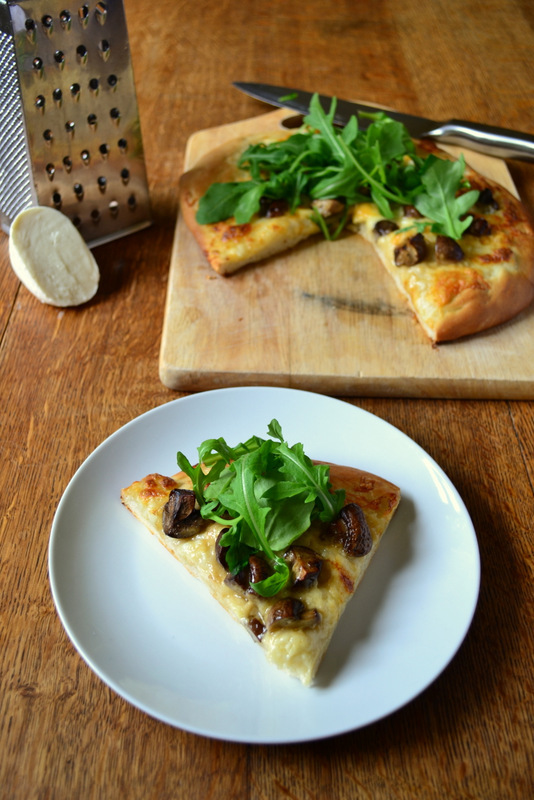 I’m a fan of pizzas with arugula/rocket on top, adds a nice fresh peppery-ness to them. This looks great! Thanks! It does and a lovely colour :D.
What a perfectly simple little pizza. To use one of your phrases, Brilliant! Haha, thanks! It was very simple indeed. I may go a little more complicated with the next of my dough balls though… we’ll see. I love garlic on a pizza, this sounds delicious! Good idea about freezing pizza dough too. Thanks! Yes, makes the next two really quick! Nadal was really petulant. At this stage in his career, he should really know better. Great looking pizza! Mushroom and garlic? Yum! He was! Exactly. Thanks, Daisy! There are few things in life more delicious than homemade pizza. 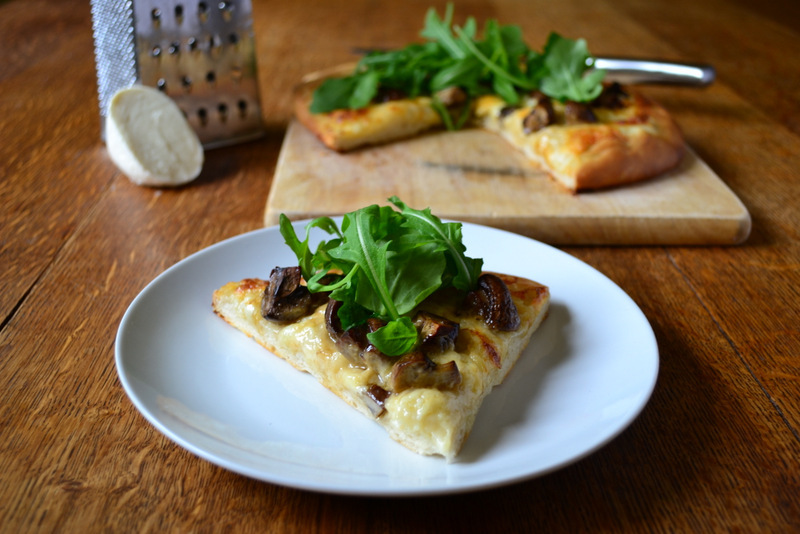 I got 2 proper pizza stones as an early birthday present and they are a-mazing – can’t recommend them highly enough! Love the garlic mushroom topping here. Absolutley mouthwatering Nick! We are big fans of the ‘no sauce’ pizza here and in fact, just made one last night (i always make a few versions) – yours looks sensational! Thanks, Shira! More to come :D.
My favorite pizza is white pizza and this seems much better and cheaper than store bought pizza! Cant wait to try it! Exactly! I really hope you enjoy it! I knew something was missing from the blogs I follow. You have stopped appearing in my reader. I will defollow and refollow to see if it fixes it. I was missing the stuff you do. Oh no! I really hope it does, Conor. That’s one delicious looking pizza. I LOVE mushrooms and topping the pizza with fresh greens is the best. I am soon trying this recipe. Thanks for sharing! Thanks! I really hope you enjoy it. This is such a beautiful pizza! It looks wonderful! That looks delicious Nick! Mushrooms and cheese – you can’t go wrong there. And garlic, don’t forget the garlic, Korena. 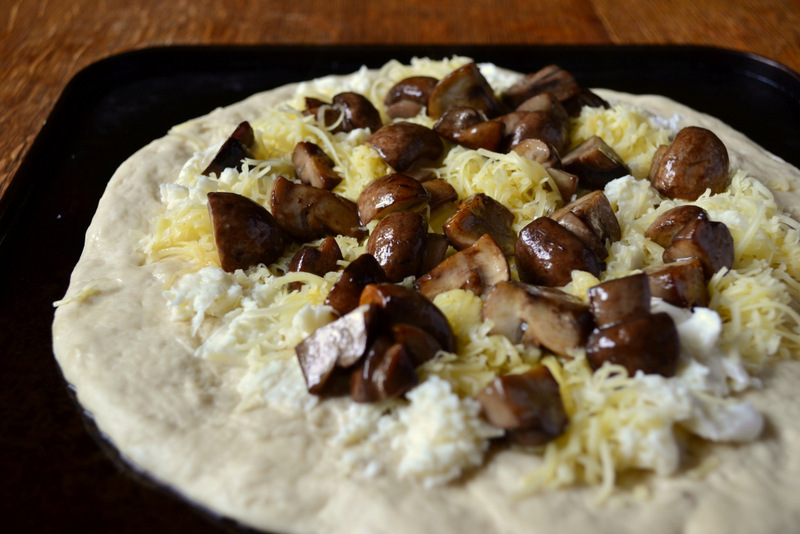 This looks delicious and I love the addition of mushrooms to cut through the cheese. Garlic is a perfect match here too. I tried white pizza in New York last week but it was just different cheeses and was very heavy and rich. Yours looks perfect. Thanks! It absolutely is! I hate heavy pizzas – it’s not how they’re supposed to be. I’m going to do this one on the grill this weekend! I will add the homemade pestos I am whipping up! Lemon balm pesto is sooo good! That sounds awesome! I’ve never grilled a pizza. That sounds amazing! I’ve never tried a white pizza before but you got me interested! And, by the way, thanks so much for visiting my blog! I love getting visitors! YUM, I love white pizzas and I LOVE mushrooms! I’ve totally come round to mushrooms – they are incredible. I was already hungry, but now that I saw this, I am STARVING! This is one of my favorite kinds of pizza! We’ve been making our own pizza lately, and I think I’m ready to branch out and make our own dough. This recipe with mushrooms and garlic sounds lovely. Do you have a pizza dough recipe? I’m a little nervous to make it myself. Thank you – I use Jamie Oliver’s, it works a treat and there was no point me stealing it put on my blog!